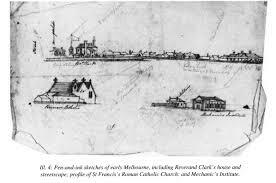 On this date in 1835 Melbourne was first settled by free colonists from Van Dieman’s Land (now Tasmania). It is the capital and most populous city in the Australian state of Victoria, and the second most populous city in Australia and Oceania. 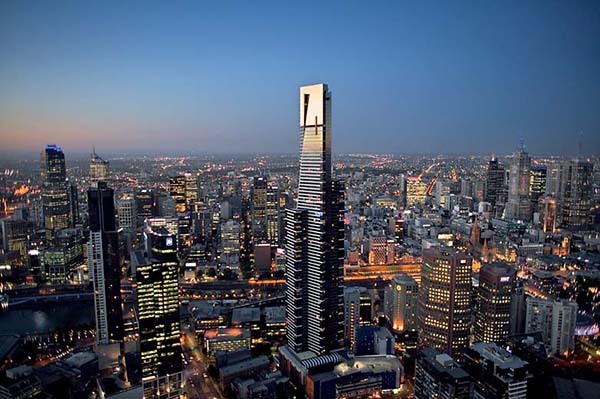 The name “Melbourne” refers to the area of urban agglomeration (as well as a census statistical division) spanning 9,900 km2 (3,800 sq mi), which comprises the broader metropolitan area, as well as being the common name for its city centre. The metropolis is located on the large natural bay of Port Phillip and expands into the hinterlands toward the Dandenong and Macedon mountain ranges, Mornington Peninsula, and Yarra Valley. Melbourne consists of 31 municipalities. It has a population of 4,442,918 as of 2014. It was incorporated as a Crown settlement in 1837. It was named “Melbourne” by the Governor of New South Wales, Sir Richard Bourke, in honor of the British Prime Minister of the day, William Lamb, 2nd Viscount Melbourne. It was officially declared a city by Queen Victoria in 1847, after which it became the capital of the newly founded colony of Victoria in 1851. During the gold rush of the 1850s, it was transformed into one of the world’s largest and wealthiest cities. After the federation of Australia in 1901, it served as the nation’s interim seat of government until 1927. Now Melbourne rates highly in education, entertainment, health care, research and development, tourism and sport, making it the world’s most livable city—for the fifth year in a row in 2015, according to the Economist Intelligence Unit. Before the arrival of European settlers, the area was occupied by indigenous peoples for an estimated 30,000 to 40,000 years. At the time of European settlement, it was inhabited by under 20,000 hunter-gatherers from three indigenous groups: the Wurundjeri, Boonwurrung and Wathaurong.The area was an important meeting place for different groups because it had plentiful water and food. The first European settlement in Victoria was established by Colonel David Collins in October 1803, at Sullivan Bay, near present-day Sorrento, but this settlement was relocated to what is now Hobart, in Tasmania, in February 1804, due to a perceived lack of resources. It would be 30 years before another settlement was attempted. 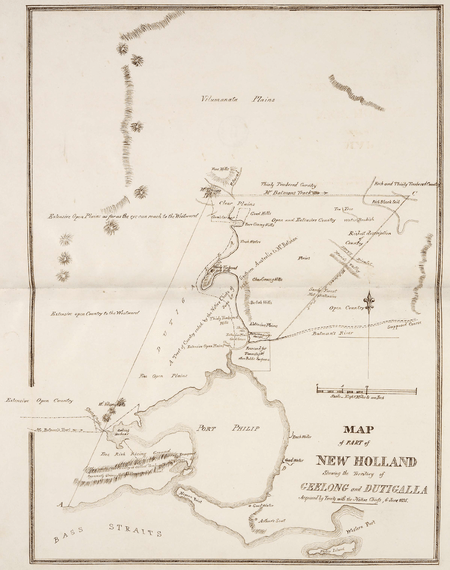 In May and June 1835, the area which is now central and northern Melbourne was explored by John Batman, a leading member of the Port Phillip Association in Van Diemen’s Land (now known as Tasmania), who claimed to have negotiated a purchase of 600,000 acres (2,400 km2) with eight Wurundjeri elders. Batman selected a site on the northern bank of the Yarra River, declaring that “this will be the place for a village”. Batman then returned to Launceston in Tasmania. In early August 1835 a different group of settlers, including John Pascoe Fawkner, left Launceston on the ship Enterprize. Fawkner was forced to disembark at Georgetown, Tasmania, because of outstanding debts. The remainder of the party continued and arrived at the mouth of the Yarra River on 15 August 1835. On 30 August 1835 the party disembarked and established a settlement at the site of the current Melbourne Immigration Museum. Batman and his group arrived on 2 September 1835 and the two groups ultimately agreed to share the settlement. Between 1836 and 1842, Victorian Aboriginal groups were largely dispossessed of their land. By January 1844, there were said to be 675 Aborigines resident in squalid camps in Melbourne. The British Colonial Office appointed five Aboriginal Protectors for the Aborigines of Victoria, in 1839, however their work was nullified by a land policy that favored squatters to take possession of Aboriginal lands. By 1845, fewer than 240 wealthy Europeans held all the pastoral licenses then issued in Victoria and became a powerful political and economic force in Victoria for generations to come.Melbourne was declared a city by letters patent of Queen Victoria, issued on 25 June 1847. 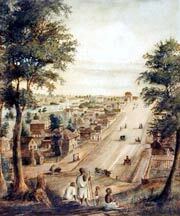 On 1 July 1851, the Port Phillip District became the separate Colony of Victoria, with Melbourne as its capital. 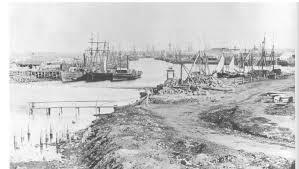 The discovery of gold in Victoria in mid 1851 led to the Victorian gold rush, and Melbourne, which served as the major port and provided most services for the region, experienced rapid growth. Within months, the city’s population had increased by nearly three-quarters, from 25,000 to 40,000 inhabitants. Thereafter, growth was exponential and by 1865, Melbourne had overtaken Sydney as Australia’s most populous city. An influx of interstate and overseas migrants, particularly Irish, German and Chinese, saw the development of slums including a temporary “tent city” established on the southern banks of the Yarra. Chinese migrants founded the Melbourne Chinatown in 1851, which remains the longest continuous Chinese settlement in the Western World. In the aftermath of the Eureka Rebellion, mass public support for the plight of the miners in Melbourne resulted in major political changes to the colony. 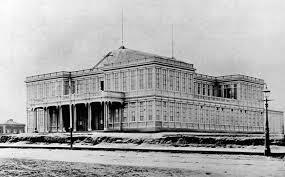 With the wealth brought on by the gold rush following closely on the heels of the establishment of Victoria as a separate colony and the subsequent need for public buildings, a program of grand civic construction soon began. The 1850s and 1860s saw the commencement of Parliament House, the Treasury Building, the Old Melbourne Gaol, Victoria Barracks, the State Library, University, General Post Office, Customs House, the Melbourne Town Hall, St Patrick’s cathedral, though many remained uncompleted for decades, with some still not finished. The layout of the inner suburbs on a largely one-mile grid pattern, cut through by wide radial boulevards, and string of gardens surrounding the central city was largely established in the 1850s and 1860s. These areas were rapidly filled from the mid 1850s by the ubiquitous terrace house, as well as detached houses and some grand mansions in large grounds, while some of the major roads developed as shopping streets. Melbourne quickly became a major finance centre, home to several banks, the Royal Mint, and Australia’s first stock exchange in 1861.In 1855 the Melbourne Cricket Club secured possession of its now famous ground, the MCG. Members of the Melbourne Football Club codified Australian rules football in 1859, and Yarra rowing clubs and “regattas” became popular about the same time. In 1861 the Melbourne Cup was first run. The decade of the 1880s was one of extraordinary growth, when consumer confidence, easy access to credit, and steep increases in the price of land, led to an enormous amount of construction. This ‘land boom’ was followed by a severe economic crash in the early 1890s which lasted until the end of the century. During the boom, Melbourne had become the richest city in the world, and the largest after London in the British Empire. The decade began with the Melbourne International Exhibition in 1880, held in the large purpose-built Exhibition Building. In 1880 a telephone exchange was established and in the same year the foundations of St Paul’s, were laid; in 1881 electric light was installed in the Eastern Market, and in the following year a generating station capable of supplying 2,000 incandescent lamps was in operation. In 1885 the first line of the Melbourne cable tramway system was built, becoming one of the worlds most extensive systems by 1890. A brash boosterism that had typified Melbourne during this time ended in the early 1890s with a severe depression of the city’s economy, sending the local finance and property industries into a period of chaos during which 16 small “land banks” and building societies collapsed, and 133 limited companies went into liquidation. The Melbourne financial crisis was a contributing factor in the Australian economic depression of the 1890s and the Australian banking crisis of 1893. The effects of the depression on the city were profound, with virtually no new construction until the late 1890s. 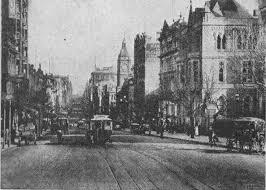 At the time of Australia’s federation on 1 January 1901, Melbourne became the seat of government of the federation. 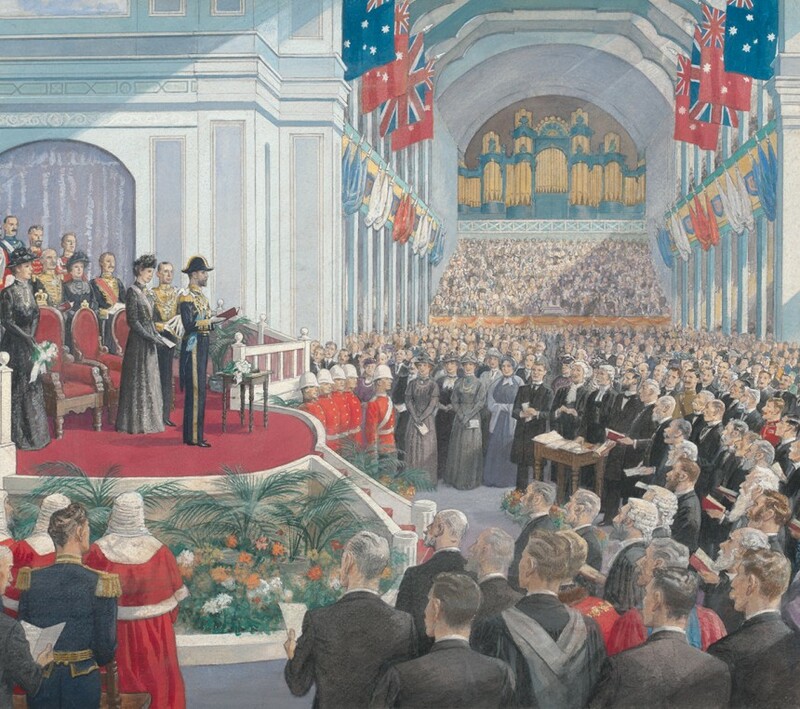 The first federal parliament was convened on 9 May 1901 in the Royal Exhibition Building, subsequently moving to the Victorian Parliament House where it was located until 1927, when it was moved to Canberra. The Governor-General of Australia resided at Government House in Melbourne until 1930 and many major national institutions remained in Melbourne well into the twentieth century. 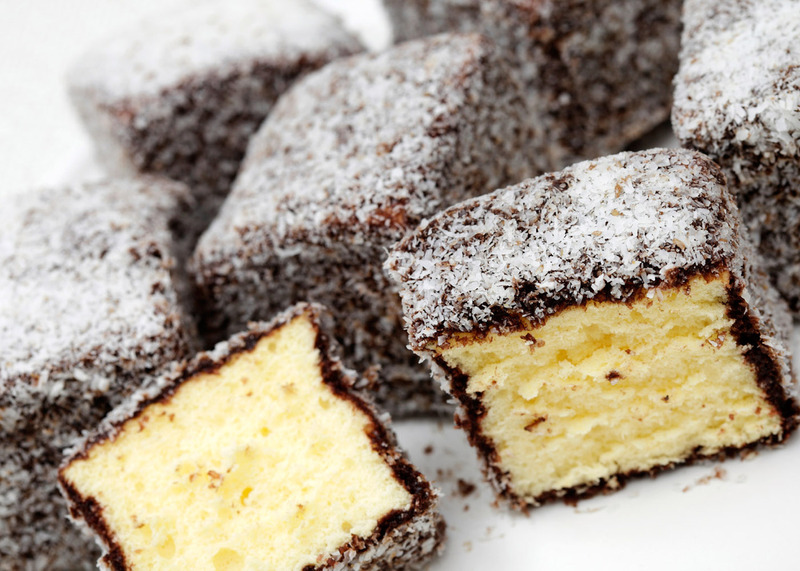 Lamingtons are the mainstay of church suppers. All you need is a picture and a general description. You take cubes of sponge cake or pound cake, spread chocolate icing over all the faces, and then roll them in desiccated coconut. To be extra fancy you can slice them in half and put jam or whipped cream in the middle. Easy peasy lemon squeezy.